The truth is there will likely be several similarities. But the one big one across the board is simple landing pages. Simple (and sometimes even ugly) converts. You’ve heard me stress this point in other posts before. But stressing the point isn’t as good as showing you exactly what I mean. 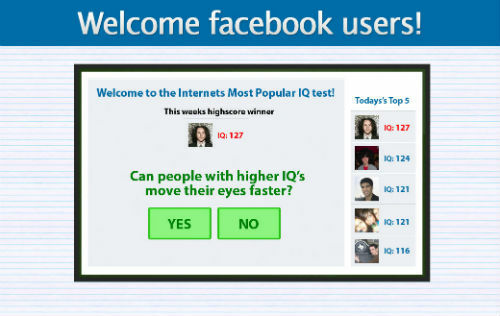 Stackman outsourced a landing page for an IQ quiz offer he wanted to run. What he got back was a pretty looking, hot mess of a landing page. He cut it up, cut it down, and generally SIMPLIFIED the page to make it easier for a lead to convert. Huge difference. You know in your gut – just by looking at these two which has a better opportunity to convert (and you’d be right). 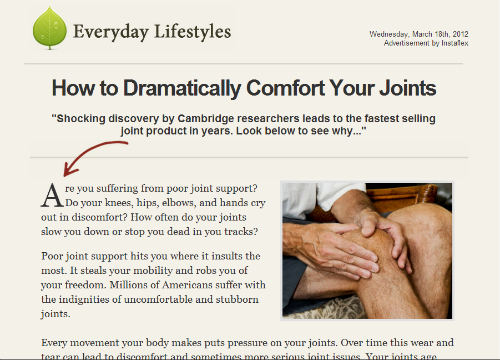 During one of my recent “treasure hunts” as I like to call them, I came across a company doing media buys for a joint pain relief product. I don’t have a before and after shot for this one. I’m sharing this lander so you can see how stupid simple it is. There’s no information on whether or not they are making money on this. 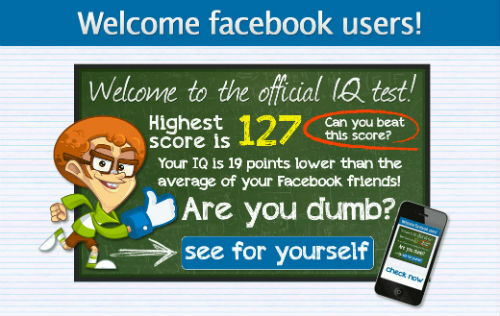 But the fact remains – they chose to test a simple landing page. Simple almost always wins. See… a simple 1 column presell letter. At the bottom there was a bright orange button that takes you to the product. I’m kind of surprised they went with an off-white background color. Although after looking at it for a few minutes it’s easier on your eyes. Maybe they’re trying to mimic real paper color? That’s something to test! Those of you that are scoffing at these examples waiting for some truly complex strategy to make a million dollars are missing the boat. What I’ve shared with you above is real. Real affiliates are using these real landing pages to make real money. How much money do you make while you’re waiting for your complex silver bullet? Simple makes money. Be simple. Do You Have a Future In Affiliate Marketing? Thanks for the advice. I’ve been burning myself out on a landing page with complexity when I forgot the core principle you reminded me of. I have to start rewriting now! glad to hear it! Keepin’ it simple will convert better and it will be easier for you to implement. I am curious what program(s) you use for building your landing pages. What do you recommend? I’m looking for something that is user friendly. There are several programs you could use. Do you have any HTML experience? You could use something like Kompozer which is a free, open source, html editor. Headway (I think is the name) is a very flexible drag and drop wordpress theme builder. Something like that will let you build different style pages within your wordpress site. 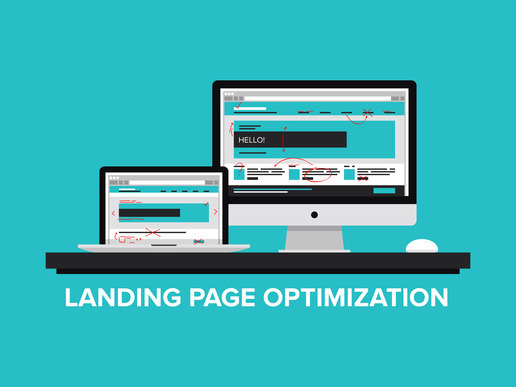 Of course there are a lot of outsourcing solutions for landing pages. I’ve hired very skilled people for as little as $2/hr. Check out odesk.com or elance.com. You’d want someone good with HTML, CSS, and graphic design at minimum. I tend to over think things to the point it paralyzes me. I have several landing pages that I need to create, but I keep putting them off because I am afraid I don’t have enough creativity to build that converts. This info helps. Thanks. You’re welcome. Just remember – you don’t need to be a creative genius to make stuff that converts! I keep putting them off because I am afraid I don’t have enough creativity to build that converts. This info helps. Thanks. http://www.gimp.org/ to create and slice graphics. http://bluegriffon.org/ for editing web pages. Or for more user friendly you can try http://www.serif.com/FreeDownloads for both. Great resources – thank you Gerard!